Devotion is a stunning artistic about-face from revered Melbourne songwriter Laura Jean. Loved for her piercing, intimate, folk-based albums such as 2014's Laura Jean and 2011's A fool who'll, Laura has worked with producer John Lee (Beaches, Lost Animal) to create an enveloping, deep pop album like nothing she has done before. 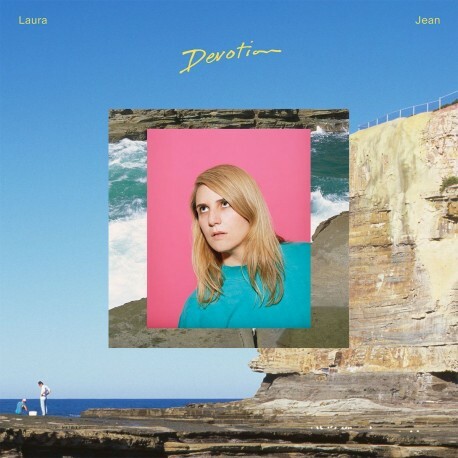 Laura's last self-titled album, recorded in the UK with John Parish (Perfume Genius, Aldous Harding, PJ Harvey) and featuring Jenny Hval on backing vocals, was a critical smash in Australia, shortlisted for the Australian Music Prize and nominated for two Age Music Victoria Awards. The album lead to Australian and New Zealand tours with Aldous Harding and Marlon Williams, plus shows with Julianna Barwick, Jessica Pratt and more. But soon Laura found herself tinkering with a 90s Kawai keyboard, enjoying its built-in drum rhythms and moody synth sounds. Laura began a series of shows performing with nothing but the keyboard, as the idea for her next album grew and developed. Devotion is an album about teenage obsession, coastal child- hood and vivid memory - universal themes filtered through Laura's razor sharp lyrical focus. Initial influences for the record took in R'n'B, 80s adult contemporary pop and 70s disco, but the end result is transformed into something wholly other, full of depth, resonance and mystery. Played entirely by Laura, John Lee and drummer Dave Williams (Augie March), Devotion is both contemporary and timeless. About the album, Laura says: "Devotion is about how a lonely coastal childhood filters into a contemporary adult life built hundreds of miles away. I wrote this album for my mum, middle sister and myself as we were at that time - eccentric, romantically-unfulfilled teens and a stressed out single mum trying to have a love life. In those times we needed to hear songs that were loving and uplifting, about the reality of intimacy, longing, romantic risk and reward. The album is narrated by me in the present, a detached adult figure far away from home, but still driven by an inner fantasy world that is set on the beach where I grew up."